I select a range of consecutive notes. The parameters window for the plugin opens: It is completely blank, cf. screenshot attached. I was expecting a form with fields to enter the parameters in. I am including the screenshot and the score that I used. That is most definitely not what should happen. Unfortunately, for me, all is working as it should (also on win7, same MuseScore version). Would you be willing to try and run the plugin from the plugin creator? There is a chance that more debug information is shown there than when it is ran from the menu. If all goes well, you should now have the TempoChanges window pop up. It might be hidden behind the normal musescore or plugin creator windows though. * Is it also empty? * Any messages in the bottom part of the Plugin Creator? Make sure to also press Stop in the Plugin Creator once you've done this test. Thanks for the fast response. I've run the plugin in Plugin Creator; the window remains empty. BUT I do get a whole bunch of error messages concerning the missing class (?) LyricsLine. There are also warnings from QOpenGLShader. I quote the messages below. So seemingly, my system doesn't have something installed that should be installed. Maybe some path is mis-configured in some configuration file – although I don't remember having touched any defaults after installation. 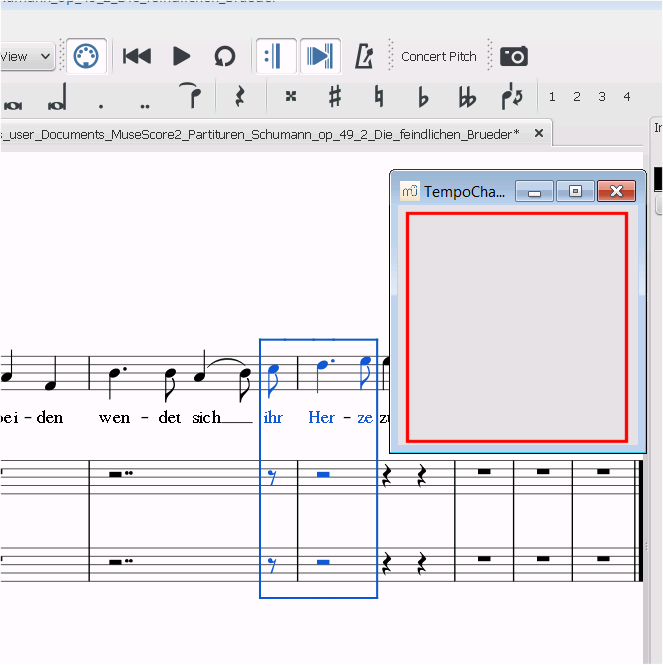 The removeSpanner messages are to be expected in the current version of MuseScore (2.0.3). You may ignore them. The QOpenGL ones however shouldn't appear and seem to indicate that there might be something missing in your installation/incompatible in your system. If so, then I doubt this plugin is the only one that's affected. In the Plugin Manager, could you enable the panel and the helloQml plugins? They are coding demos that come along with the MuseScore installation. Same effect: The panel and window are both empty. So QOpenGLShader might be the culprit. Do plugins use a different kind of software modules than core MuseScore? I haven't found any glitches in core MuseScore windows and panels so far. I did some quick googling for “QOpenGLShader: could not create shader” and found, amongst others, the following lead: “Some systems will not be able to run with real OpenGL, simply because the drivers are insufficient. In particular low-end Intel GMA and similar graphics are affected.” My driver is compatible up to and including OpenGL 2.1. This might be relevant or not. Plugins do make use of an extra part of Qt (QtQml) which isn't used by the main application. It is part of the same Qt distribution (which comes with MuseScore) though. It might indeed be that there is an incompatibility with your specific graphics card (which one is that?) or that your installation somehow is incomplete/corrupt. For the latter, you could try redownloading the installer and reinstall MuseScore to see if that helps. Were you able to reinstall and did it help you? Any more info on the graphics card? Have the same problem. I use a relatively old win 32 system and Musescore works without problems, except plugins... I did not use that until yesterday. Suppose the graphics card is outdated (Intel GMA 3150) . Tried also to programm a bit, managed to create a messagebox, but any other kind of graphical output failed. For the graphical plugin framework support of OpenGL2 is indeed required. You might get lucky by manually updating/changing your driver (see https://downloadcenter.intel.com/product/48011/Intel-Graphics-Media-Acc…- ) but be aware that it might not be that easy at all because of the dated hardware (see https://superuser.com/questions/536129/intel-3150-officially-wont-suppo… ). Note that you will still be able to use some of the plugins as not all plugins require additional user input. I've had issues with this for quite a long time. I've gotten around it by eliminating the dialog portion of any plugin I run, but that isn't a very workable solution. Finally got a Vista driver for my cheap graphics card, which restored the OpenGL2 functionality in my Windows 10. And my plugins work now! Previously, if I ever had a code error in my plugin, besides having the real error in the console, I would have about 20 lines of OpenGL shader errors also. Hoping that's fixed.